The 2015 Fall Edition of COLORS is the Field Notes Shenandoah notebooks. Matching the colors of the leaves of the the Sweet Birch, the Chestnut Oak, and the Red Maple all found in the Shenandoah National Park, the Field Notes Fall Edition comes in three green French Paper cover stocks. The covers are made with duplex card stock which is different colors on each side, not just printed on each side but two color papers fused together. The 48 interior pages are 60#T Finch Opaque “Bright White” graph paper. The back cover has information about the particular tree found in the Shenandoah National Forest. The Field Notes Shenandoah Memo & Notebooks usually ships within 1 business day unless otherwise specified. Each Field Notes Shenandoah Memo & Notebooks we sell is guaranteed to be genuine, authentic and will arrive brand new & unused! Great little books for taking with you, and making notes for easy reference. This is the Field Notes special edition for colors Fall of 2015, the Shenandoah, which represents the colors of the trees within the Shenandoah National Forest. It's a three pack of notebooks. Each have 48 pages of graph paper. It has a little sleeve that holds the three-pack together. The sleeve actually feels like it's made of the same material as the cherry wood Field Notes notebooks, actual wood on the exterior fused to paper. This is the three colors available in the Field Notes Shenandoah Special Edition. Each of them represent a tree within the Shenandoah National Forest. This particular color is the Red Maple. We also have the Sweet Birch and the Chestnut Oak. Also included with the pack is just a simple hello information on their sign-up for their newsletter or email. On the inside, they use a duplex process to fuse two different color papers together. It's not printed. It's actually two separate pieces of paper they fused into one, which, to me, really makes sense since the interior is kind of the Fall colors. We've got the orange, we've got yellow, and we've got red on the interior of each of these. They're each different, but the fall colors of the Fall leaves. Since it's a Fall edition, to me it makes perfect sense. The inside is a standard graph paper, Field Notes paper. These are some great, durable notebooks. Great to carry with you. 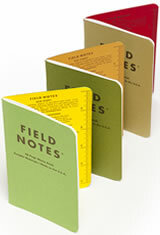 Get your Field Notes colors editions for the Fall of 2015. Shenandoah from PenChalet.com!